Idles about. Occasionally runs in circles around the player, leaving behind a small dust trail. This companion is a rare tier Zandalari archaeology item. It is created by discovering and "solving" 185 Zandalari Archaeology Fragments. Players may utilize up to three Zandalari Idols to aid in the solving of this item. 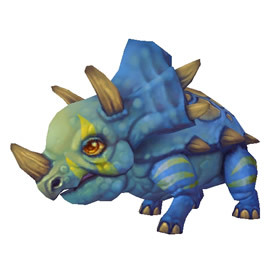 Once completed, an entry on the Direhorn Hatchling can be found in players' archaeology tab: "The Zandalari are regarded for their beast taming, and one of their greatest allies is that of the direhorn. Plated skin, with spikes protruding from various directions, this creature offered both protection for istelf and that of its master. It was custom for its future master to be the first to see it when it broke free from its shell.surrender." Rushes to the enemy, dealing 453 Beast damage. Yes, I was very disappointed that it was exactly the same. They could have recolored it a little bit, at least. This pet is from Archeology, however you might be a little disappointed (I was) when you get it! It is the same exact COLORS as the Pygmy Direhorn from Throne of Thunder. The Direhorn species is among the toughest and strongest of all things that walk on Azeroth. They can seem like gentle giants, but be cautious that you don't find yourself in front of one when they are on a warpath.